The obvious answer is that the project was proposed before 2008 and New York State now lacks the money due to the recession. However, the GLOW project was proposed in 2009 when New York was arguably in worse financial shape than it is now. The correct answer is found in the differing philosophies of the leadership of New York State. The GLOW project proposals were initiated in December 2009, by then NYPA President Richie Kessel. Former Governor David Patterson, who was arguably not very frugal with state expenses, appointed President Kessel to his position. Fast forward to January 2011 when Andrew Cuomo was sworn in as governor of New York State. Governor Cuomo’s fiscally conservative policies were evident in his first budget, which consisted of many state budget cuts. He also directed his agencies to do more with less and cut their budgets. On July 27th it was announced that Richie Kessel was stepping down as NYPA President, effective September 6th, 2011. On September 27th, 2011, just three weeks later, NYPA announced that the GLOW project had been scrapped due to cost. This does not mean that Governor Cuomo and his agency heads hate clean energy; rather it shows that the governor and NYPA will not spend tax revenue on projects that are not worth the return. This will also allow the state to invest that $60-$100 million per year into other economically feasible green projects. Thanks for posting this! I am really curious as to why there would have been such a low return from this planned wind farm, and why the annual costs would have been so high. Was the wind energy not as high in the area? And who was producing the turbines that would be so expensive to maintain? I often drive by the large windfarms outside of Bath, NY and Warsaw, NY on my way home on weekends and was always under the impression that, other than minimal maintenance and the initial installation costs, they were pretty cost effective, but the decision of the NYPA clearly suggests otherwise. Adam, I don’t know the specifics of power output and costs, but like you said the benefit must have not been great enough to warrant the cost. 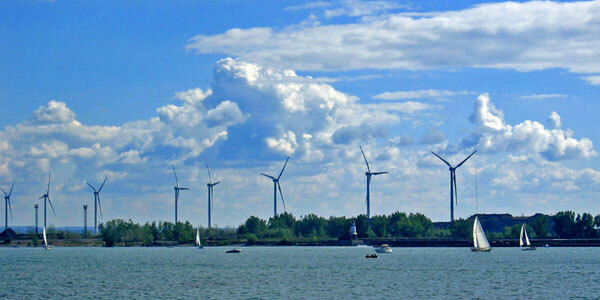 I do know that the proposed wind farm in Lake Ontario would have cost more than the Lake Erie project or inland projects. The reason for this is that Lake Ontario is much deeper than Lake Erie, which would have required a lot more material and work to construct the bases for the windmills. There was also a lot of backlash from the local communities that border Lake Ontario because they did not want fishing to be disrupted or have their lake views ruined.